How to prepare Emoji Jell-O / Emoji Gummies? Happiness is Edible Emoji jellos!!! something creative idea to make the party rock. If you’re planning a celebration or a themed party, Emoji jellos or gummies will make your party an event to remember! These flavorful and fun Jell-O's or gummies are an awesome way to make your typical assortment of sweets more exciting. When you want to sweeten up your kids, family members or friends day, or an event, you try this instant homemade and easy peasy Emoji jellos, and I am sure this will rock the party! And now, you can also be playfully and sweetly express your emotions with this cutie, sweet - Emoji jellos! They will also make great party favors for your guests, no matter the age! Have some fun with your snack with this Emoji jellos; you can also be prepared with different flavors like Pineapple, Orange, and Lemon. And different shapes like Thumbs Up, Smiley Faces, Sun, Heart, and Star, Flowers, this chewy, sweet and sour gummies will be just as fun to play with as it is to eat. This Emoji jellos made with lemon flavored Jell-O. Start feeling good with these deliciously Emoji jellos. So express your happy😍 emotions, moments with this complete set of Emoji Jellos! 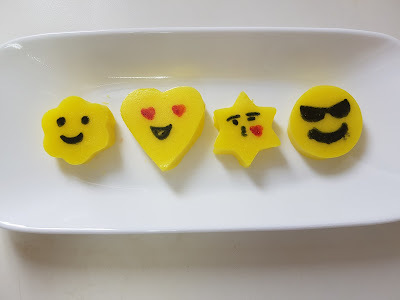 This Jell-O emojis can make a fun gift for all ages, they’re great for sharing, perfect for parties, festivals and much more, so it's Diwali time, and it can be a great gift to your loving once. Emojis are increasingly finding their way into our daily lives, and various emoji shapes have been gaining popularity over the years. Do you know when the World Emoji Day celebrates? Yes, there‌ is even a World Emoji Day, it's celebrated on July 17! Happiness 😊 is Edible Emoji jellos!!! Each Emoji Jell-O have 34 kcal. 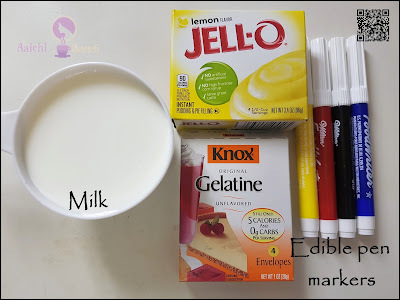 In a bowl add 2 cup of milk (room temperature), then add lemon flavoured Jello and unflavored gelatin 2 packets. 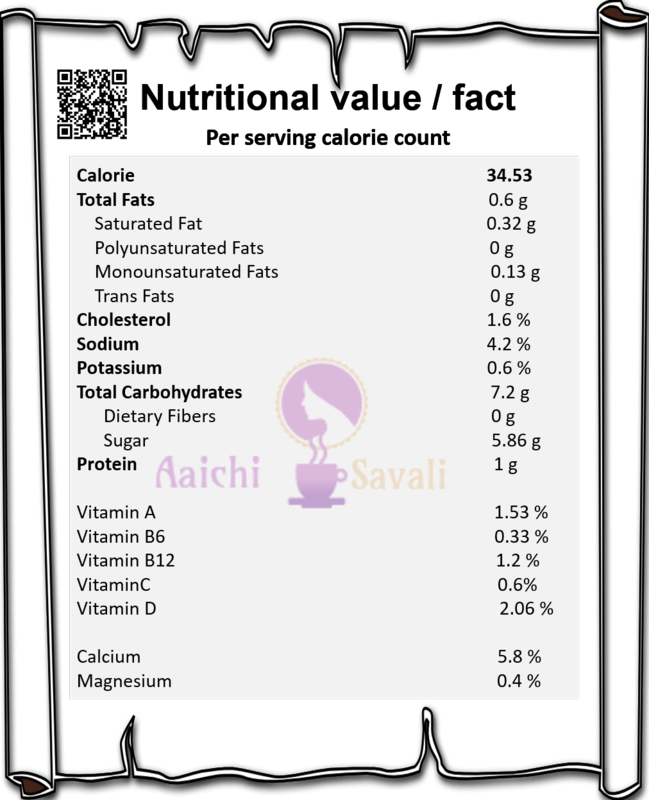 Mix all very well for at least 3 min or until completely dissolved in milk (remember lump should not be remain). Now, microwave the Jell-O mixture for about 30 seconds, you can see the flowing consistency of Jell-O. Refrigerate it for about 15 minutes, after 15 minutes Jell-O base to make emojis will be ready. Cut into decorative shapes as you like, I have used 4 types of moulds to make gummies. (Reuse remaining jellos by microwaving for 30 seconds and freeze it for 15 minutes). Here, tiny tiny, cute, and most important edible emoji gummies are ready. Enjoy!!! 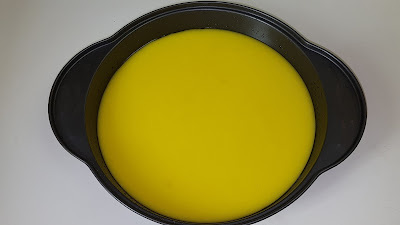 If your Jell-O didn't get yellow color you can add a pinch of yellow food color. If you want it more sweet you can add powdered sugar. If your Jell-O didn't get flowing consistency then you can microwave more 30 seconds. emojis very accurately and nicely. Based on a 2000 calorie diet. It makes 15 servings. Per serving contains 34.53 calories, along with carbohydrates - 7.2 g, fats - 0.6 g, proteins - 1 g.
It is good to eat emoji jello / gummies as a dessert.